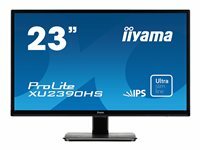 ProLite XU2390HS is a 23” LED backlit LCD Screen featuring IPS Panel technology which is considered to be the best all round panel type. It offers accurate and consistent colour reproduction with wide viewing angles (178°/178°) and fast response time. XU2390HS is full HD, has a >5mln:1 Advanced Contrast Ratio and 250 cd/m² brightness offering the user a clear and vivid image. 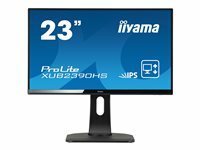 The ProLite XU2390HS will provide excellent performance for photographic design, web design, standard office use and in multi-monitor environment. Very suitable for multi-monitor Digtal Signage and office applications. IPS IPS technology offers higher contrast, darker blacks and much better viewing angles than standard TN technology. The screen will look good no matter what angle you look at it. Overdrive On/Off When very fast graphics are displayed your monitor can sometimes get blurry. Turning on the OverDrive feature will eliminate that. VESA VESA mount compliance means you can easily mount the LFD to any mounting that complies with the VESA standard. HDMI (High-Definition Multimedia Interface) HDMI stands for High-Definition Multimedia Interface. Much smaller and more convenient than DVI, HDMI also has the significant advantage over DVI that it supports audio as well as video signals. Full HD With true 1920 x 1080p resolution your monitor is ready to display high definition images. This means you can accommodate more information on your screen; e.g. 60% more in comparison to a 1280 x 1024 monitor.